In the spring of 2002 I accepted a half-year appointment as a Visiting Professor at Tokyo Institute of Technology in the Department of Mathematical and Computing Sciences. In conjunction with this appointment. I was asked to design and teach a graduate course covering topics of my own choosing. I was advised that my class would consist of graduate students ranging from beginning to advanced, with some near the completion of their degrees. I decided to lecture on the basics of metric and topological fixed point theory. The fact that the course would be taught in English, a second language for both myself and my students posed an obvious obstacle. With this in mind, I decided to prepare complete written lecture notes to the students. It is these notes that provide the basis for this text. In planing and designing my course I had two things in mind. First, the course should be accessible to students with only standard knowledge of mathematical analysis, topology of metric spaces and functional analysis. Second, the lectures should frequently end with examples of open problems in the field, showing ways and indicating directions for individual studies. My personal tastes and preferences motivated the selection of topics. 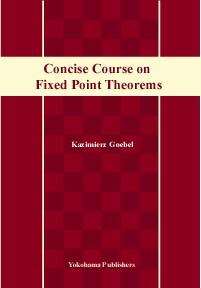 Indeed, many important branches of the fixed point theory are mentioned only briefly if at all. Suggestions for future research projects are selected from those problems I have encountered, and in some cases invented myself, during my over thirty years working in this field. Colleagues I have talked with over the years will quickly recognize this as a collection of loose essays on some of my favorite subjects. 1. What is Fixed Point Theory ? 2. The Banach Contraction Principle. 3. A Visit to the Geometry of Banach Spaces. 4. Elements of Nonexpansive Mapping Theory. 7. The Topological FPP and Brouwer's Theorem. 8. Compact Sets in Banach Spaces: Schauder's Theorem. 9. Equivalents of Brouwer's and Schauder's Theorems. 11. What Happens in the Noncompact Setting? The proof of the Lin-Sternfeld Theorem, an outline. 12. Minimal Displacement, Retractions and Homotopies. The case of Hilbert space.